Yesterday we went to Emma’s farm in Ham to buy 4 more chooks. We have brought from her before, the chooks are reasonable and good layers. We got 4 Rhode Rock black tails and brought them home to join the flock, as we have lost a couple of hens through natural causes recently. Whilst there we went to see Emma’s other animals. She has a turkey called Paxo who is just a pet, not for eating, several dogs and pigs and a few orphan lambs she was bottle feeding. But her big goat was the one that got my attention. He leaned up out of his stall and I got the impression he wanted to plant a kiss on me!! I tried not to get too near, but he was a handsome fella. She also had 2 large white pigs who had just had litters. One pig had 10 piglets and the other had 12 really tiny ones, just a day old that were snuggled up to Mum under the heat lamp. I do love seeing all the animals and wish we had space for some pigs and lambs but for now 22 chickens will have to do. Yesterday we went to the Green Scythe Fair at Mulcheney, in Somerset. It is an annual event which is as”green” as possible with power from solar panels or stationary bikes, compost loos, lots of recycling and no mains electricity on site. There are various stalls all round the arena which is where the scything competitions take place. But no Ross Poldark here, they all kept their shirts on inspite of the warm weather. This is what greeted us at the entrance, wicker figures. There were lots of stalls selling food, some vegan, some veggie and some not. Neil and I shared a pizza. Dancers formed a circle and danced along to music from a group of musicians. People were dressed up and lots of children had their faces painted. Another group of musicians, this time dressed as pirates, were performing on a stage and whilst we were there, played a raucous version of “Riding on a Donkey”. At a green crafts area our friend Emma was teaching basket weaving. The fair was finishing with a ceilidh in the evening , although we didn’t stay for that. We were lucky with the weather and it made a very enjoyable day out. One of our favourite walks is to go to Otterhead Lakes and walk by the lakes and through the woodland. We went a couple of weeks ago when my brother was here but the bluebells were not quite out so we went again today to see the beautiful carpets of flowers. The sunlight was just shining through the emerging Beech trees with their light green leaves. Just off the path before the bluebells were beds of wild garlic. As we walked further down the blue of the bluebells got more intense. Neil took my picture sitting amongst the flowers. This is such a beautiful place, so peaceful and today there were no other people around, just the sound of the birds and the rustling leaves. We stopped by the first lake and could see the swan still sitting on her nest and also the Heron was in the same place as we had seen it a couple of weeks ago. I took a picture of Neil by the lake. As we were driving from the car park up the lane we noticed that the Devon banks were also topped with bluebells. We are so lucky to live nearby. 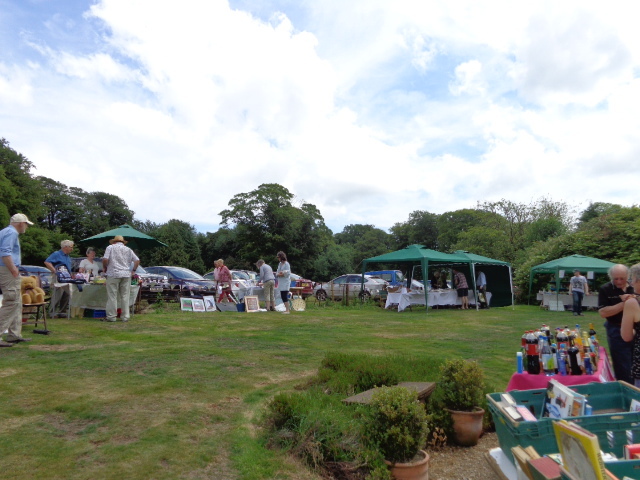 Saturday saw the annual Buckland St Mary Summer Fete take place. We were so lucky as the sun shone and we have a glorious day for it. 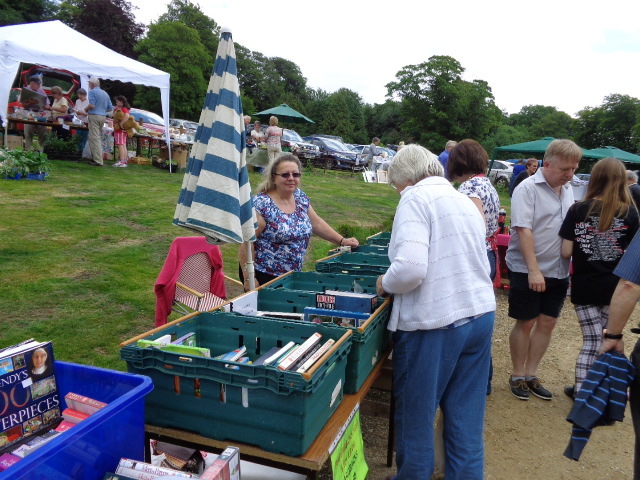 Neil’s sister Carole came down to help on the book stall. We raised £72.80 which isn’t bad when you think we were selling paper backs for 50p! There were lots of other stalls including a cake stall where I bought a delicious lemon drizzle cake. The afternoon tea and cakes proved very popular. Over £1200 were raised altogether which goes towards funding our youth worker. 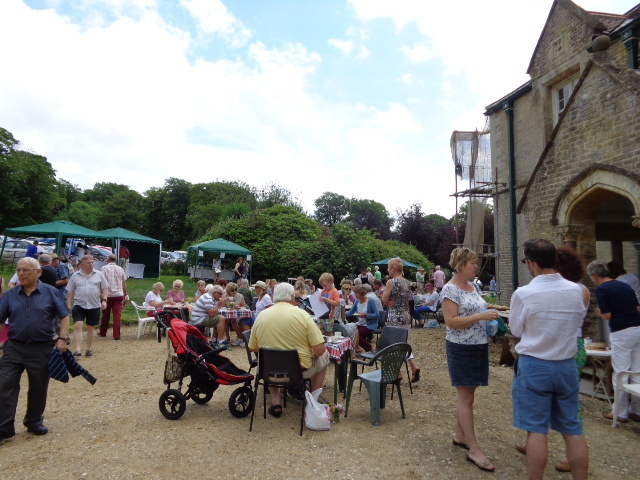 The summer Fete was a great social occasion in the village, a good time to meet up with friends and neighbours and have a chat in the sunshine. Next week it is the Duck racing so watch this space for news of that!! 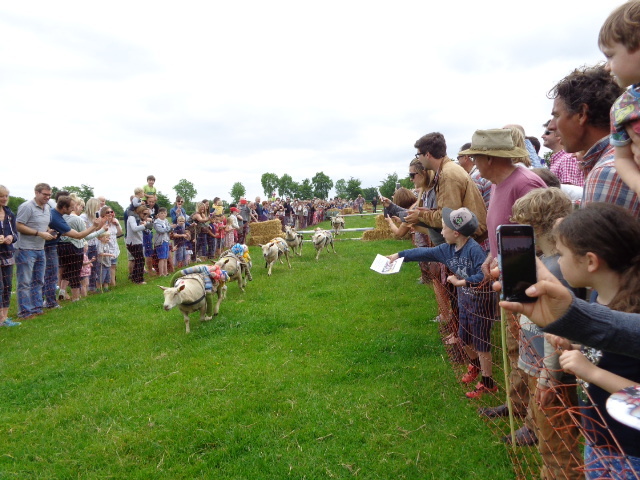 Yes you did read it right, sheep and Pig racing – that’s what us country folk get up to at the weekend. 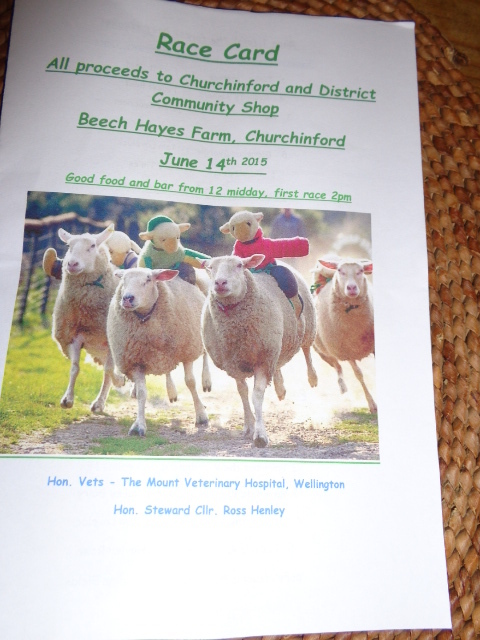 It was held today at Beechayes Farm, Churchinford, so of course we had to go along. A bit of madness but good fun. 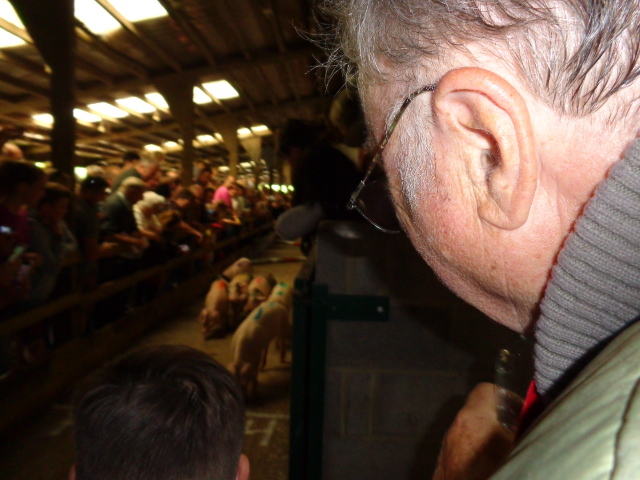 There was a Tote and you could bet on the pigs and sheep just like you do horseracing. The pigs were marked with different colours. Their race was inside a barn and it was rather crowded so I struggled to get a good picture. Outside was the run for the sheep. 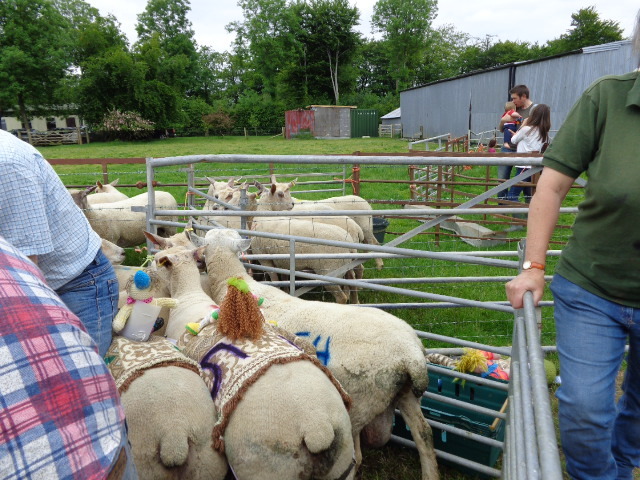 Firstly they had saddles with doll riders attached to the sheep. Then they were herded up to the top of the run and let go. 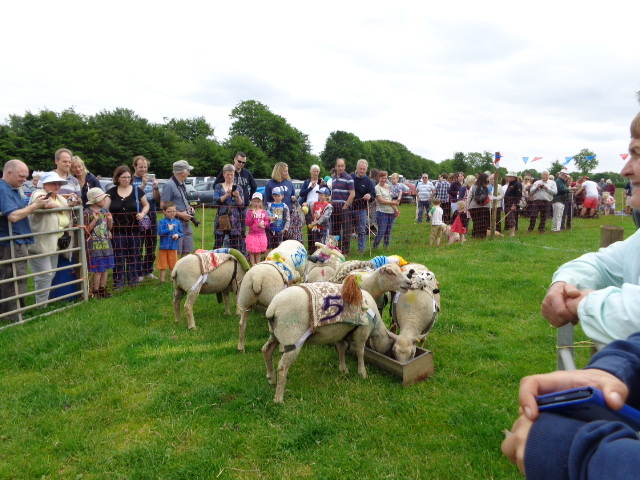 It was fairly slow at first, then the sheep got the hang of it and came charging down the run, over the little hurdles. At the end of the race the sheep got some feed as reward. The event was very well supported with lots of people in attendance. Hot food was provided by the ladies of the Smeatharpe WI who always do a good job. So a fun afternoon all round.